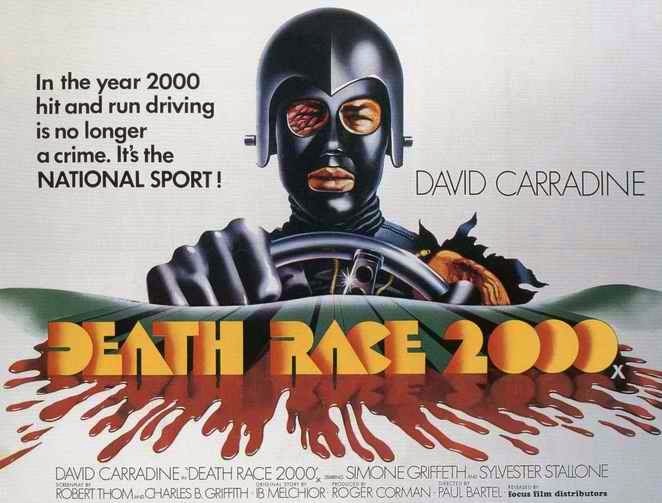 Death Race 2000 is slightly miraculous for several reasons: 1) It was filmed for a budget of only $300,000, yet it looks like a big blockbuster, 2) They were able to snag David Carradine [after he starred in the hit TV series Kung Fu] and Sylvester Stalone [right before became a mega star with Rocky] as a part of that small budget, 3) Director Paul Bartel used cinematographer Tak Fujimoto early in his career before he racked up an impressive resume including Silence of the Lambs and Ferris Bueller’s Day Off, and 4) Roger Corman was at his best as producer of the movie. The stars aligned in the making of Death Race 2000 which can be described as a Sci-Fi comedy with a little gore thrown in the mix. The plot is simple: It’s the year 2000 in America where it’s annual government sponsored entertainment extravaganza is a cross country race where competitors score points for killing pedestrians. It’s sort of a Hunger Games on wheels, as it were, since the racers also end up getting killed off as well until only one remains standing. David Carradine is Frankenstein who is a veteran of this race. His costume, which is mostly black leather, is very effective and he plays the charter perfectly. Sylvester Stalone is the slurred-tongued [No surprise there!] Machine Gun Joe Viterbo who is a larger than life Italian Stallion gangster [No surprise there either!]. He does what he does and does it well! The rest of the cast is just as good and director Paul Bartel gets great performances from everyone. Considering the often obscene amounts of money that Studios spend these days on blockbuster hits, they could learn a lesson from Death Race 2000. More money does not a great movie make [Battlefield Earth comes to mind]. Long live independent cinema! Definitely give this one a chance.